want to keep up with traffic. Speeding has been a factor in over 37% of crashes involving 16-year-olds. 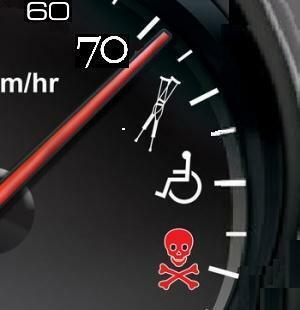 55% of teens killed in car crashes weren’t using their seat belts..unthinkable!!! The U.S. Department of Transportation predicts a 50% reduction in the number of deaths and injuries if every-one buckles up. One excuse for not buckling up on city streets is the belief that non-highway collisions aren’t as serious. However, studies show that about 80% of auto accidents occur at speeds of less than 40 mph and that chances of death or injury at low speeds when the driver is unbelted are three times greater than for belted drivers. About 75% of motor vehicle accidents occur within 25 miles of home. An excuse for not buckling up on the highway is that collisions at 60 mph or more are usually not survivable, whether or not occupants are buckled up. That argument disregards the fact that, in the seconds before a collision, the driver of a vehicle traveling 60 mph usually brakes, reducing the crash speed substantially and increasing the chances of survivability for those wearing belts. Two Simple Things Would Save Thousands of Lives a Year.